Report Prompts Calls To End Freddie Mac's Conflict Of Interest : The Two-Way Lawmakers and prominent economists on Monday called for changes at the taxpayer-owned mortgage company after NPR, in partnership with ProPublica, revealed that Freddie Mac has placed multibillion-dollar bets against American homeowners. A sign for Freddie Mac in front of its headquarters in McLean, Va.
Several U.S. lawmakers and prominent economists on Monday said Congress and the White House should end a financial conflict of interest at the taxpayer-owned mortgage company Freddie Mac. 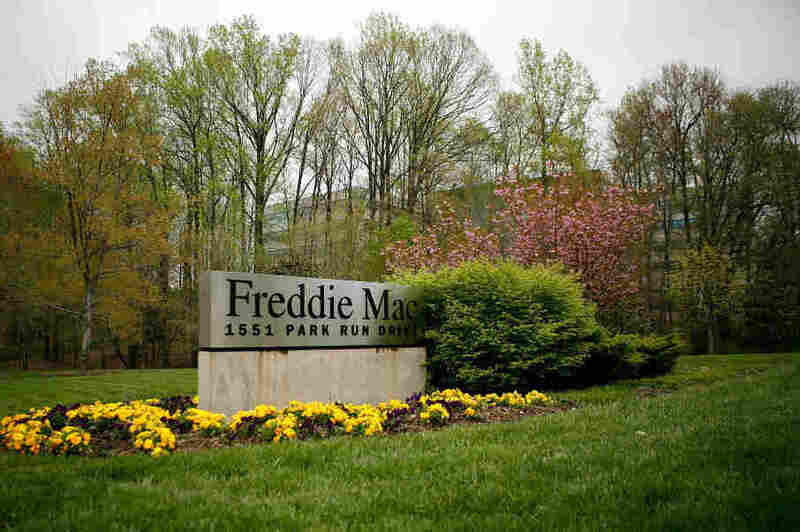 Freddie Mac, which has a public mission to help make home ownership affordable, also has placed multibillion-dollar bets against American homeowners being able to refinance to cheaper mortgages. NPR, in partnership with ProPublica, an independent, nonprofit newsroom, first revealed Freddie's bets on NPR during Monday's Morning Edition. Later in the day, Sen. Bob Casey, D-Pa., expressed "outrage" in a letter to President Obama, calling on the White House to "to put an end to these practices." Freddie's regulator, the Federal Housing Finance Agency (FHFA), late Monday issued a statement saying that last year, it began assessing Freddie Mac's controversial investment strategy. In December, "Freddie Mac agreed that these transactions would not resume pending completion of the examination work," it said. However, FHFA acknowledged that Freddie continues to hold $5 billion worth of the investments, known as inverse floaters. That figure was even higher than the $3.5 billion NPR and ProPublica had tracked down. FHFA did not say when its examination of Freddie's practice would be completed. It said only that FHFA already had "identified concerns" about the kinds of risks Freddie Mac was taking and "the controls" it had placed over its investments. White House spokesman Jay Carney said at a press briefing that the Treasury Department is looking into the matter. Sen. Johnny Isakson, R-Ga., told NPR that having a financial stake in blocking mortgage refinancings means Freddie Mac officials "would be in conflict with themselves, and that wouldn't be the right thing to do." For months, Isakson has been promoting legislation to make it easier to refinance mortgages backed by Freddie Mac and Fannie Mae, another government-sponsored enterprise in the mortgage industry. The bill, written with Sen. Barbara Boxer, D-Calif., is intended to help some eight million homeowners with mortgage rates exceeding 6 percent to refinance at today's lower interest rates, below 4 percent. Boxer issued a statement saying Freddie Mac's investment practices "raise serious questions about Freddie's commitment to new efforts to increase refinancing opportunities to help struggling borrowers." Columbia University economist Chris Mayer has long been urging Congress and the White House to promote a large-scale refinancing strategy. He says that dropping the typical mortgage down to today's rates could save each homeowner roughly $3,000 a year. That would help the U.S. economy by "putting tens of billions of dollars back in consumers' pockets, the equivalent of a very long-term tax cut," Mayer said. Not all economists agree. Anthony Sanders, an economist at George Mason University, said lowering mortgage payments wouldn't be a quick cure for the housing crisis. "That's wishful thinking," Sanders said. "The primary causes of mortgage default are job loss, or job curtailment, health problems where they get excessive bills, or believe it or not, divorce." Still, Sanders says Freddie Mac should not be structured in such a way that it has two goals: 1) to help make home ownership affordable and 2) to run up financial gains in its own portfolio through the use of risky investments — especially those that run counter to the interests of homeowners. He says his email inbox has been getting filled with messages from other economists and policy experts reacting to the investigation into Freddie Mac's investment strategies. "Everyone is in various degrees in rage," Sanders said. His correspondents have been saying this is "a terrible public-policy debacle by Freddie Mac." Public documents, checked by NPR and ProPublica, show that in 2010 and 2011, Freddie Mac set out to make gains for its own investment portfolio by using complex mortgage securities that brought in more money for Freddie Mac when homeowners in higher interest-rate loans were unable to qualify for a refinancing. Freddie's trades came at a time when mortgage rates were falling to record lows. This is the conflict: Millions of homeowners wish they could refinance, but their lenders tell them they can't qualify for today's low rates because of tight rules. Freddie Mac is one of the gatekeepers with the power to set those rules, and lately, it has been saying no more often to homeowners. "Freddie Mac prevented households from being able to take advantage of today's mortgage rates — and then bet on it," Alan Boyce told NPR. He is a former bond trader who has been involved in efforts to push for more refinancing of home loans. Freddie officials repeatedly declined to comment on the specific transactions, but Freddie did say that its employees who make investment decisions are "walled off" from those who decide the rules for homeowners. No evidence to the contrary has emerged. More about the reaction to the NPR/ProPublica report was on today's edition of All Thing Considered and is planned for Tuesday's Morning Edition.